Where did the predators go? I thought I would post an amusing, but thought-provoking blog today. In a recent class of mine we started talking about sentinel species and surrogate contaminants as a means to track public health impacts, or the potential for same, in people. The discussion got into the commonality of wolves, sharks, alligators and snail kites as role players for ecosystem health. In each case the top predator control the other species. The most obvious example is wolves. When returned to Yellowstone National park, the beavers returned. AS opposed to hunting the beavers to extermination, it appears that the lack of predators cause the elk to feed closer to streams, thereby depriving the beavers of the aspens needed for beaver dames. And thus the wetland ponds virtually disappeared as well. A recent Sun Sentinel article noted that the Fish and Wildlife Service has shot an amazing 75,000 coyotes in the US last year! Biologists noted that the coyote has expended into areas that wolves used to inhabit (including Alaska!). They did it because there are no wolves – the wolves did not tolerate that competition. Without the wolves, there is not stopping them or their associated destruction of small animals. We see hardhead catfish, a scourge of coastal fishermen, abundance now that baby shark populations have diminished. The sharks consume the same stuff the catfish to, then move on. The catfish, not so much and OW!!! We change the top predator and the system changes, often irreversibly. 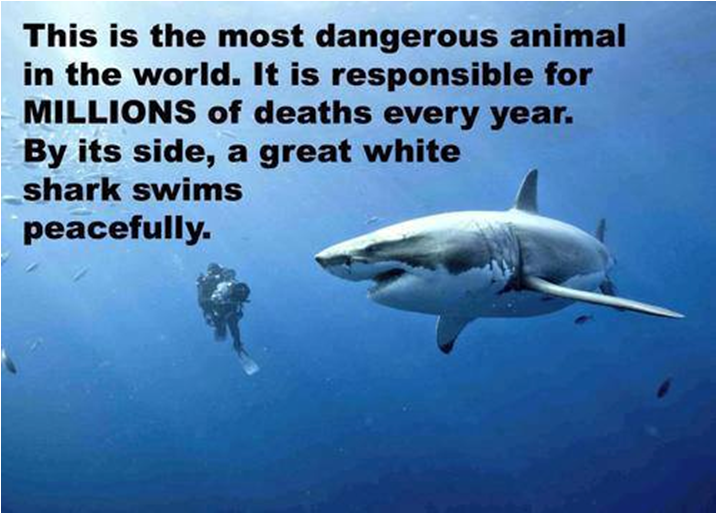 Which raises the question about the deadliest predator -us. We’ve moved in everywhere we wanted after eliminating the competition. The question is: Are we wolves, or hardhead catfish? Musings – I was sent this on the internet. No clue the source. Bad investments – public or private. In either case, if the revenues are not realized, the local entity gains no benefit. This can include public private infrastructure investments, privatization or investing cash. Scenarios need to be created to figure out what happens when things don’t go as planned. Failing to save for a rainy day before the crash. Our grandparents knew we need to save for a rainy day. We talk about the lowered level of savings among Americans and the potential issues that could arise if economic difficulties occur. So exactly why do our elected leaders think it is a great idea not to collect monies in good times for a rainy day? Other than politics that is? Can we repay those funds we “borrowed” from during the down years? Can we keep the total revenues increasing (may not mean a tax increase, but certainly not a rollback)? Can we develop realistic scenarios for public investments. Nothing worse than stranded infrastructure like that $6milion parking garage that grossed under $100 in the last 6 months because no one uses it because there is not business need for it. Can we develop reserve policies that allow local governments and especially utilities to create and maintain repair and replacement funds, reserves, and “savings” for the next rainy day. It’s coming. At some point. Can we develop a 5 year plan of where the community vision is? I think this would be a start for a lot of us.